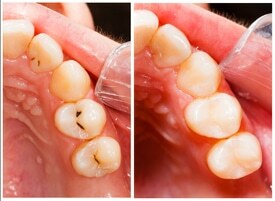 What you should do following a composite filling? Home/Blog/What you should do following a composite filling? Dental fillings are used to fill the holes caused by tooth decay and prevent further serious tooth damage. They help in the restoration of the tooth’s natural appearance and function. Normally, dental fillings are prescribed by dentists to fill a less extensive damage caused by tooth decay. There are different dental filling materials to choose from. They can be made from metals such as gold and silver amalgams, porcelain and the most popular material, composite filling. Composite filling is made from composite glass and plastic particles. They are visually pleasing to the eye because they are able to copy the appearance of your natural tooth. They are the preferred choice of filling to be used in the front teeth. Following the dental filling procedure, you can resume your normal diet because composite fillings are already set hard using a blue light. Inform your dentist if your composite filling is too high or if it feels uneven when you take a bite. Sensitivity to food temperatures especially to cold foods are common within the first week the procedure is done. You can take over-the-counter pain medications to alleviate the discomfort felt. If you have unprompted pain that persists more than 30 minutes, call your dentist immediately. Practice good oral hygiene. Brush your teeth every after meals and practice flossing at least once daily. Have your dentist check your teeth regularly especially the status of your dental filling.